This is a rectangular Dickinson’s Globe Poultry Feeds porcelain sign. This particular Dickinson’s Globe Poultry Feeds sign is predominantly white with brown text. 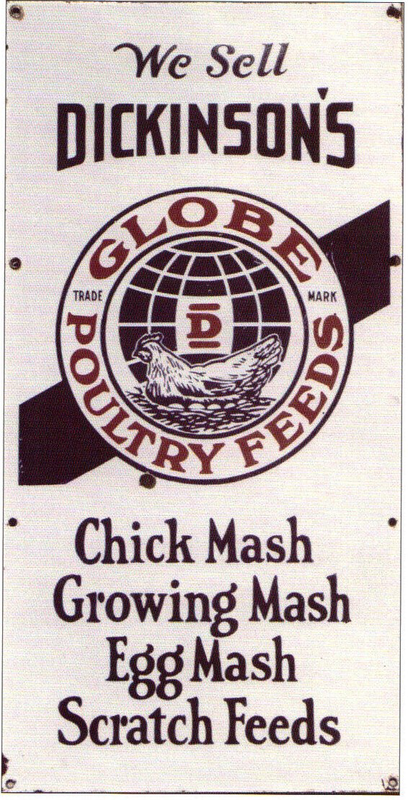 It reads, “We Sell Dickinson’s Globe Poultry Feeds, Chick Mash, Growing Mas, Egg Mash, Scratch Feeds” and features a hen laying eggs in front of a globe in the center.